Out-Numbered: And The Winner Is... Are... Whatever. OK. I'll make this quick, so I can get back to embarrassing myself on the interwebz. 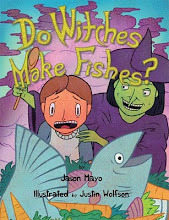 Thanks to all of you sick bastards and bastardettes that participated in the "Do Witches Make Fishes? ", signed book give away. I almost pooped myself reading this stuff. Unfortunately there can only be three winners this time around but fear not, there will be other opportunities to engage in penned debauchery and mayhem. "So... Which one of you would like to discuss a Happy Ending?" "Belle, Sleeping Beauty, Cinderella, and the eighth dwarf - Gropey." If you are one of the above, hit me at: Witchesandfishes@gmail.com with your mailing address. The book will be available on or around September 7th. I'll ship em' off as soon as they're in my grimy, little paws.